Cleaning your roof is an essential home maintenance task that is often neglected by property owners. The fact that you can not properly see how filthy your roof is until you actually climb onto your roof and get close to the roof tiles, ensures that the majority of property owners in Sydney delay cleaning their roof. What are the benefits of cleaning your roof? If no one actually notices how dirty your roof is, why should we even worry about cleaning our roof? Benefits of cleaning your roof tiles. Even though we might not notice the mould, grime and dirt that builds up on your roof, it is the first thing that visitors to your property notice. The overall impression of your property is elevated when your roof tiles are cleaned of gunk. Mould, algae, lichen and moss that is growing on your roof tiles can transfer into your roof cavity and be circulated in airflow throughout your house. If any members of your family are susceptible to allergies or respiratory conditions, it is even more important to regularly clean your roof tiles. Roof replacement is no simple task and is a significant investment, so if you can extend the lifespan of your roof by regular maintenance, you could save yourself thousands in repair fees. What Are The Options For Cleaning Your Roof Tiles? If you do not have the relevant safety equipment to safely access your roof, or you are not confident in working at heights, do not even think about DIY roof cleaning. Roof cleaning companies like Sydney Roof & Gutter offer surprisingly affordable roof cleaning services. Don’t risk your life and limbs to save a few dollars. Give them a call today or visit the roof cleaning Sydney website for a free quote. If you have all of the safety equipment and physical health to safely access your roof, read on. 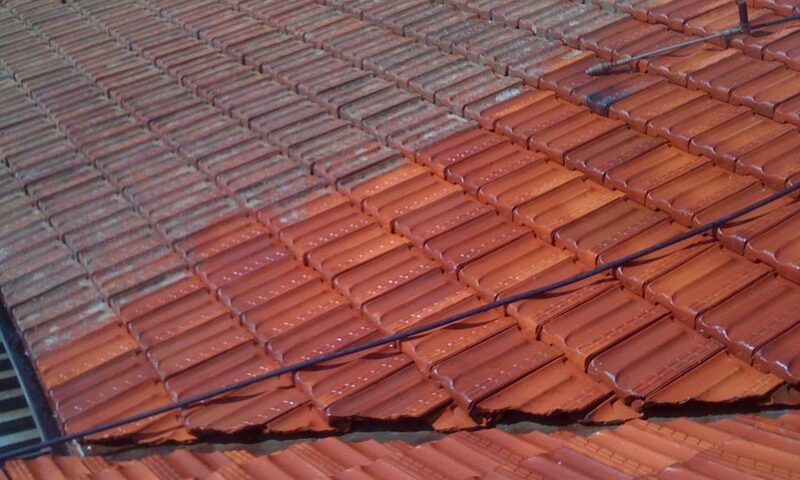 One of the most iconic types of roofing materials throughout some of the more traditional suburbs in Sydney, terracotta roof tiles look great once they are cleaned properly. The main goal of cleaning your terracotta roof tiles is to not only blast away the grime, grease and mould from the tiles but to also prevent further mould growth. Before you climb onto your roof, establish a plan of action. Identify where you will start to clean. A lot of times, the first time someone cleans a roof they will back themselves into a corner as they have not planned the best system for cleaning their roof. Start from the highest section and work down. Working from the furthermost point, apply a mould remover to the surface. Allow it to soak it for the length of time the manufacturer recommends. Once the cleaner has soaked into the porous tiles, it is time to blast away the grime. Before you start pressure cleaning, make sure that your gutters and downpipe are free of obstruction. Now it is time for the real work to begin! Set your pressure cleaner to about 3000psi, although old and brittle tiles will require a lower pressure. By keeping your pressure washer on about medium pressure, you will have enough force to remove stubborn stains without blasting your tiles to shreds. Keeping the nozzle about 30cm away from the surface using long smooth strokes to wash away the cleaning solution and dirt. Work backwards so that you are standing on a dry surface. Work in small sections. Clean that section thoroughly, then move to another section. This will allow you to focus on moving safely across your roof. Even though it can be tempting to crank up the pressure with the goal of getting the job done faster, if the pressure is too high it will damage the tiles and cause water damage in the internal cavity of your roof. Taking the time to evenly and smoothly clean using the nozzle about 30cm from the surface will ensure you are not left with ‘zebra stripes’. The right angle needs to be maintained so that water is not blasted underneath the tiles and into your roof cavity. When walking on the tiles, endeavour to keep your feet where the tiles overlap as this is the strongest section. Step lightly and move slowly so that you do not crack, snap or break the tiles. Identify the support beams and rafters before you step on the roof so that your footing is safe. Keep an eye out for any damage, cracks or broken tiles while you are on your roof. Wet & Forget is the simplest moss, mould, lichen and algae remover on the market. While it will not produce the same results as pressure cleaning, it offers a quick and convenient option for cleaning the mould off your roof. Choose a day when there is no rain forecast. The product needs to be diluted 1 part with 5 parts water in a garden sprayer. Soak the area of the roof that you are going to clean. Start at the furthermost point and work backwards, this ensures that you are walking on a dry surface. Generously apply the solution to the dirtiest sections of the roof. The product is just left on the surface of the roof. No spraying, no scrubbing and no rinsing. Just leave the product and watch it clean over time. 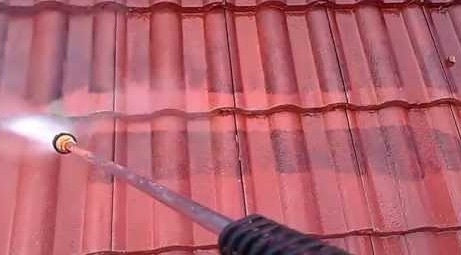 The manufacturer highlights that it will take “6 to 12 months for the roof to come clean.” Note that while this is the simplest way to remove mould and mildew from your roof, it does take a long time to see the results and it will not remove the grime, grease and dirt from the roof tiles. While it may not be the most glamorous home maintenance task, cleaning your terracotta roof tiles is one of the best value for money property maintenance tasks you can do. By extending the lifespan of your roof and gutters as well as being able to identify any minor roof issues before they get too serious, regular roof cleaning is one of the savviest decisions you can make in protecting your property. If you can not safely access your roof, engage the services of a professional roof cleaning company to complete the project for you. Call arround for free quotes and read reviews on the companies before you engage their services. Sydney Roof & Gutters invites you to inspect their wide range of genuine customer testimonials on their company website today. ← How To Use Unique Furniture To Create The Perfect Look!